Re-released as freeware on December 23, 2005. To run correctly in DOSBox, set cycles=max and timed=false. 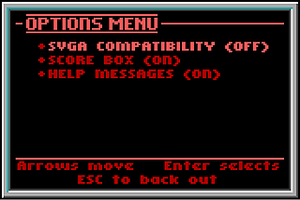 Leave all other DOSBox settings at their defaults. The freeware version includes a DOSBox patch; newer versions of DOSBox don't need this and it can cause problems. The extension matches the episode number. Save games are SAVEGAM0.BM1 to SAVEGAM5.BM1; the extension matches the episode number. No cursor; mouse is used only for menu navigation. 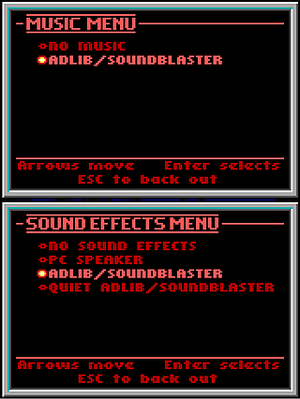 Music can only be toggled; two volume levels for Sound Effects. 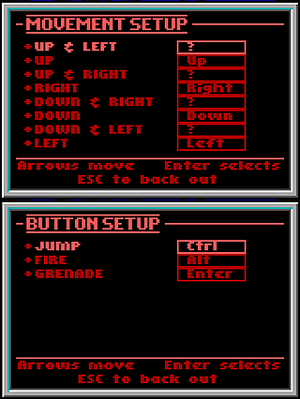 Ensure you have set the DOSBox joystick timing correctly (see Run in DOSBox). ↑ 2.0 2.1 File/folder structure within this directory reflects the path(s) listed for Windows and/or Steam game data (use Wine regedit to access Windows registry paths). Games with Steam Cloud support may store data in ~/.steam/steam/userdata/<user-id>/358180/ in addition to or instead of this directory. The app ID (358180) may differ in some cases. Treat backslashes as forward slashes. See the glossary page for details. 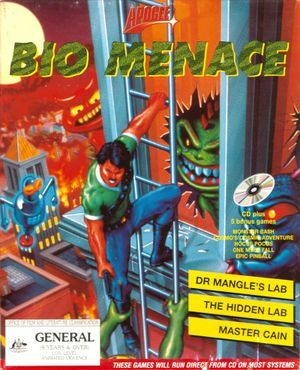 ↑ 3D Realms News: Bio Menace released as freeware!